The seminal work, back after 50 years. 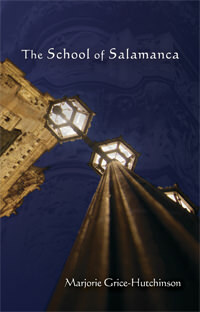 Marjorie Grice-Hutchinson's remarkable classic, The School of Salamanca, posed an extraordinary challenge when it first appeared in 1952. The book is not only a pioneering presentation of this lost school of monetary theory--fantastic thinkers of Old Spain that were more advanced than the English classicals centuries later--it is also beautifully written. One can see how it came to have such influence on both Joseph Schumpeter and Murray Rothbard, both of whom used this work as their major source material. Until this edition, the book might have been very expensive except for one thing: it was completely unobtainable anywhere by any means. Even devotees of the history of thought have not been able to put a copy in their personal libraries. The Mises Institute is thrilled to bring it back to the public. Spanish scholars have long known about the great economists of the late middle ages and their works. But for English speakers, this book broke completely new ground. It not only highlighted an unknown school of monetary theory. It presented the origins of economic theory on the Continent, prompting a rethinking of the entire history of the discipline. A theme emerges from this work. These thinkers were pro-market, pro-hard money, anti-state in many ways, pro-property, and pro-merchant to a surprising extent. Their theoretical orientation was subjectivist, marginalist, and process oriented. In other words, the Salamanca School represented a kind of proto-Austrian school with a strong liberal bent (liberal in the old sense). In this sense, it becomes clear that modern-day Keynesians would benefit from learning what the Schoolmen knew many hundreds of years ago. Grice-Hutchinson is an outstanding tour guide and teacher. As the description mentions, Murray Rothbard thought very highly of this book. After reviewing the text for myself, I can certainly understand why. The Spanish Scholastics faced a dilemma in their day: Since much of Europe was under canonical law, they were looking to these highly educated Roman Catholic theologians for answers regarding major economic problems. The booming trade with the Americas/importation of gold was giving birth to ever more complex trade disputes and monetary mysteries. Why were the prices of goods and services higher in one area than another? Why did hard money (precious metals) seem to vary in purchase-power from city to city & country to country? What were the monarchs and merchants to do with regard to their financial policies in the light of these mounting problems? Rothbard concluded that these men laid the foundation of what is now called "Austrian School" economic theory. This well-written book tells how and why these men conquered this daunting task.